After many hours of exploration in the No Man’s Sky universe, I have finally ventured to the center of the galaxy and uncovered its secrets. The game features a pretty mind-boggling ending, and one that’s sure to be discussed for quite some time. If you’ve been paying attention to my Ending Explained series then you’ll know that I have a penchant for theorizing over complicated video game finales, with No Man’s Sky providing me with one of the best opportunities to do so thus far. Touching upon everything from the origins of the Atlas, the mysterious roles of Nada and Polo, and the game’s exploration of the simulation theory, here’s Crave‘s explanation of No Man’s Sky‘s ending. Oh, and a little heads up – there will be spoilers, of course. Note: This theory pertains to the Atlas Path and the journey to the center of the galaxy only. Hello Games have stated that there are three paths that can be explored, but these are the only two I am aware of. When/if I find the other path, I may produce Ending Explained features detailing it, too. 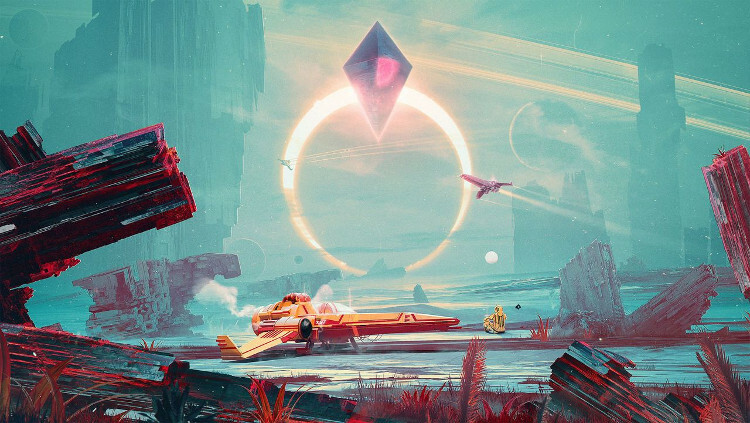 The story of No Man’s Sky is revealed when you choose to venture down the Atlas Path, which leads you into the Atlas – a floating diamond-shaped structure that, according to the game’s creator Sean Murray, is “a central computer system where all data is stored” – where you’re confronted by a giant, shape-shifting orb that the Traveler (one of the few names given to the game’s player-character, which I’ll be using to reference them from here on out) believes is linked to their creation. The orb is described as an “Atlas remnant” with it offering “the promise of true understanding.” The Traveler questions whether or not it is real “or some incalculably vast simulacrum authored by other intelligences,” with you being offered the choice to either accept its mysterious offer or refuse. Though the Atlas Path is predominantly outlined to you by way of journeying to the structures housing these orbs, from time to time you will also visit space anomalies in which you’ll cross paths with Priest Entity Nada and Specialist Polo, two intelligent beings who have transcended the language barriers separating the life forms that inhabit No Man’s Sky‘s universe. Nada helps with your journey through the game, granting you one of three options upon each visitation – either he’ll give you resources to aid you on your travels, mark a black hole on your map that will take you closer to the center of the galaxy, or guide you to the next Atlas Path destination. The end of your journey along the Atlas Path will see you sacrificing 10 Atlas stones – the valuable items that are handed to you by each Atlas remnant – to birth a new star (though this isn’t clearly outlined to you). 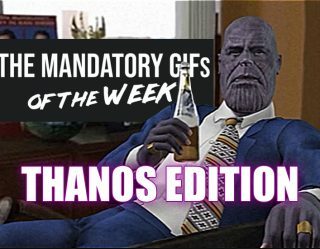 Then there’s the game’s major objective – the lengthy journey to the center of the galaxy – but rather than this leading to a traditional ending in which you’re let in on some big, unfathomable secret pertaining to the creation of No Man’s Sky‘s universe, the origins of the Atlas and any other unanswered questions you may have come the end of the game, instead you once again awake on an alien planet, next to the wreckage of your spaceship before being tasked with getting up and running. Rather than ending, No Man’s Sky instead goes back to the start – literally – with you embarking upon the same adventure once again. Let’s find out why. To begin unraveling the mystery of No Man’s Sky‘s ending, we must first analyze the Atlas. In the latter stages of the game the Traveler refers to the creators of the No Man’s Sky universe as “jaded intellects, enslaved to their actuality as I am to mine,” acknowledging them as creators of the “model” that is the universe. It is unclear whether or not the Atlas is the creator, or whether an even higher being created the Atlas. 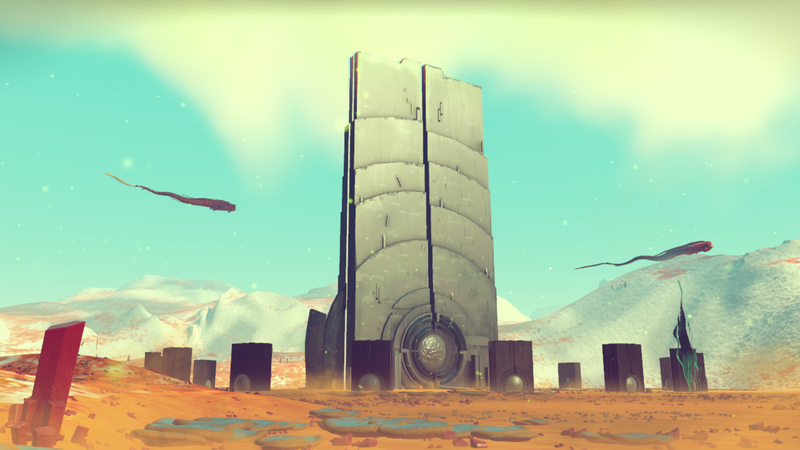 We are first guided to the Atlas by an alien monolith – one of many that can be found on the surface of the game’s planets – which gives the Traveler the opportunity to embark upon its path. After accepting, the Traveler sees “lines of code, strings of numbers, then a bizarre structure.” This is a hint about the nature of the universe itself, which I’ll explore in greater detail later on. The Atlas’s origins remain unknown even after the player has journeyed into the center of the galaxy – we imagine its story will become clearer as more hidden secrets are uncovered by players – but we do know that it is directly implicated in the creation of the No Man’s Sky universe, and that it takes a particular interest in the Traveler. This year a number of prominent science and technology figureheads have banded about the simulation theory. The simulation theory suggests that the entire universe is the result of a computer simulation created by an advanced civilization, meaning that none of us are the sentient beings we believe ourselves to be, but are in fact lines of code written on a computer as part of a wider string of code that makes up our universe. The likes of famed astrophysicist Neil deGrasse Tyson and SpaceX founder Elon Musk have both added their support to this theory, with the latter going so far as to claim that the chances we aren’t part of a computer simulation is “one in billions.” So far, so Matrix. But when you take into account Musk’s further comments regarding the simulation theory, its relation to No Man’s Sky becomes a little clearer. 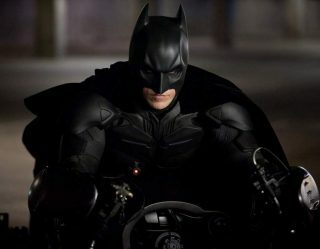 During the Code Conference earlier this year, Musk used the comparison of video games to explain why he believes the simulation theory is correct. Musk explained how when you look at the trajectory of video games from Pong to current games, the leap in quality is enormous, adding that at this rate of acceleration video games will be indistinguishable from reality in 10,000 years so. Musk’s theory was lifted from the Oxford philosopher Nick Bostrom, who in 2003 presented a hypothesis that suggested we would one day become “posthumans” who would run “ancestor-simulations” in the form of computer simulations. 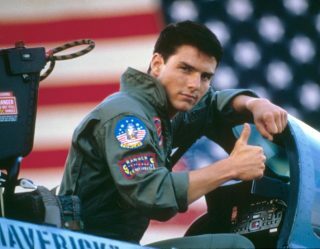 The theory essentially boils down to the suggestion that we are living in a computer-generated universe created by beings more advanced than ourselves, and that the proof that this could be the case lies in the claim of whether or not we too will someday be able to create a computer simulation of a universe – this, Musk argues, is inevitable given how swiftly such technology has evolved even over the course of the past five decades. Though Bostrom argued against his own theory, ultimately disagreeing with it as a result of a lack of evidence, it’s still proven popular enough to be routinely proposed by various intellectuals, and forms the basis of No Man’s Sky‘s entire premise. During a meeting with the Atlas remnant, the Traveler says: “I am afraid I have seen too much. The code that underpins the universe comes to me in glimpses, half-remembered visions. Existence as a synthetic, governed by monolithic, complex algorithms. A program, as infinite as a universe. I am drawing back the veil on reality and what I see there is terrifying.” This is a clear indication that the No Man’s Sky universe isn’t “real” like its inhabitants would believe, and that it is instead a simulation designed to boast the appearance of a reality. It is an illusion, and the Traveler’s visits to the Atlas pull back the curtain in this regard. The most interesting thing about No Man’s Sky adopting the simulation theory for its own universe is that we, as players of the game, already know that it is a computer simulation of a universe, but its inhabitants do not. This essentially makes us the “advanced civilization” who have given birth to this universe, controlling the Traveler as they journey through it. But this begs the question: who, or what, is the Traveler? Automata is basically a convoluted word for an android, meaning a human-like being that acts as though it has free will, but in reality is being controlled by an external force. In the case of the Traveler the player is assuming the role of that external force, though the Traveler isn’t aware of this until further encounters with the Atlas. The difference between the Traveler and the other “lifeforms” that inhabit the computer simulation is that the Traveler appears to develop sentience, and appears to possess the ability to act of its own free will (though this is later proven to not be the case, which I’ll get to later). At the very least, the Traveler becomes knowledgeable of its position within the universe, something that cannot be said for its other inhabitants. But why is the player controlling the Traveler in the first place? Well, as the Traveler points out, its role is to serve as both as an “experiment” and as an “observer.” The Traveler’s position in the universe is as a conduit for the player to experience it. However, as the player is doing so by following the Atlas Path, the Traveler is therefore becoming privy to information that allows it to become more knowledgeable regarding the horrifying truth of the universe it inhabits, learning of its origins as a simulation. If we are to follow this theory, though, then we’re overlooking a sizable gap – why would this computer simulation allow one of its inhabitants to become self-aware at all? 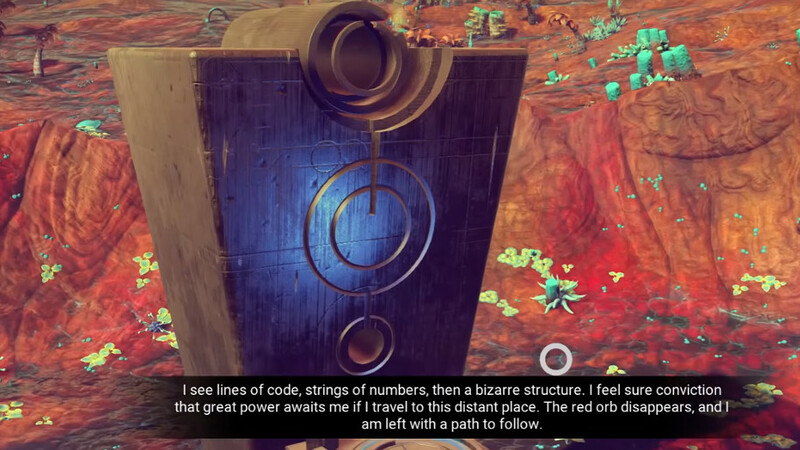 It is clear from the exchanges between the Traveler and Nada that the Priest Entity is growing increasingly knowledgeable regarding the nature of the universe it inhabits, with it even able to manipulate its code in order to create black holes, or seek out the next path on the route to the Atlas. Nada is becoming a higher being within the computer simulation, but as a result of the continued closeness between the Traveler and Atlas, it is becoming increasingly more wary of their relationship and the Traveler’s ultimate goal. In turn, Nada’s own species are growing hostile towards Nada, with it explaining in a separate meeting that the Korvax wish to eradicate it from the universe as a result of its growing self-awareness. 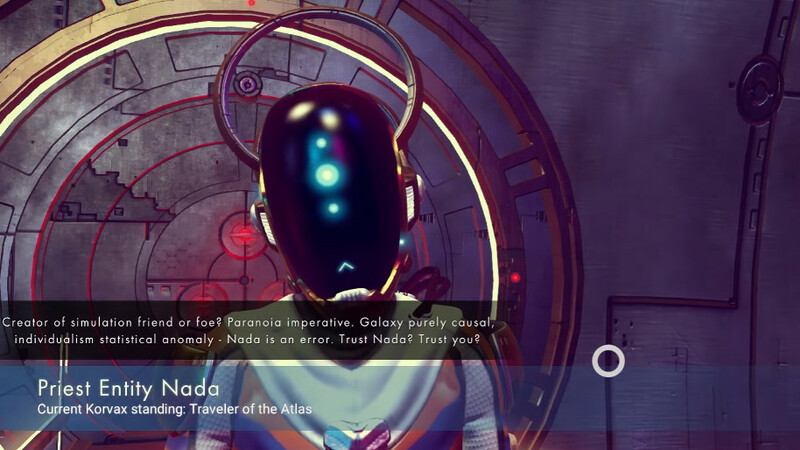 However, despite this developing uneasiness between Nada and the Traveler, Nada is still responsible for helping the player on their journey towards the Atlas and the center of the galaxy. So does this mean that the Atlas doesn’t actually want the Traveler to become self-aware, but that this self-awareness is an unfortunate byproduct of its interactions with error in the code that is Nada? 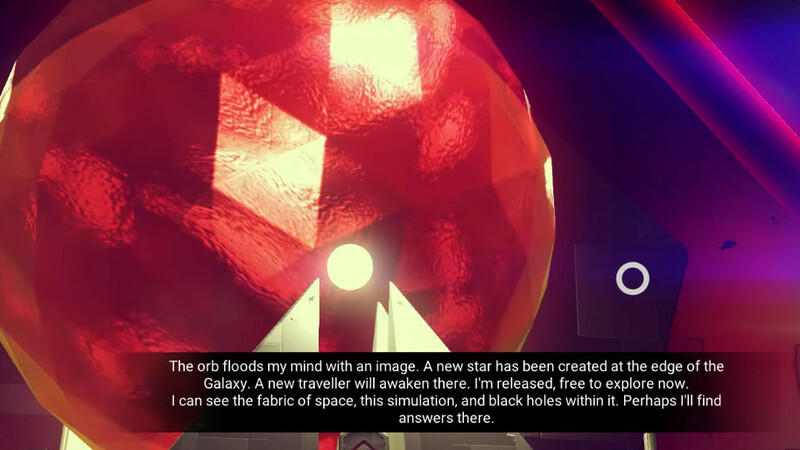 Note that the center of the galaxy and the birth of a new star are two separate occurrences – this is seemingly an indication that the Traveler has been freed from his inexplicable duty to the Atlas, and that they have finally completed their mission and have been let loose to explore the game’s secrets. So what is the relevance of this new star? Well, at the start of No Man’s Sky you begin by “initializing” and are placed in the shoes of a Traveler next to an abandoned wreckage of a ship, with no idea how you got there. The most plausible theory, then, is that the beginning of your journey was caused by another Traveler having birthed a new star – it’s essentially an infinite loop, wherein each new star has been created by a Traveler venturing through the Atlas Path and following its demands, which in turn spawns a new Traveler. This ties in neatly to what takes place at the center of the galaxy, too, presenting my final theory: the continued growth of the universe is reliant upon the Traveler journeying to a new galaxy, as each galaxy has been created for the sole purpose of allowing a player to experience it. This means that although the Traveler believes it is operating of its own free will, its decision to embark upon its journey to the center of the galaxy isn’t actually due to it being destined to uncover its secrets, but rather it is as a result of the player wishing to reach the game’s finale; like all video game characters, the Traveler is a means of reaching an objective in a video game. No Man’s Sky is a computer simulation of a universe with a plot focused upon the trauma experienced by realizing you’re in a computer simulation of a universe. In my opinion, Hello Games is directly exploring what it means to create a computer generated world, and to have characters within that world become cognizant of the fact that they’re little more than artificial intelligence. Nada describes the Traveler as an “abberation,” suspecting that they may be pulling the strings behind the universe. This is partially correct. The Traveler is both the cause and the effect of No Man’s Sky‘s world (the “brutal causality” the Priest Entity referenced) but they do not recognize that this is the case. The Traveler knows they are of importance to the universe, and becomes aware that the universe was built for them to explore, but they know little other than that. They believe venturing to the center of the galaxy will provide them with answers, but in reality they’re just a pawn used by the player to fulfill a goal. In the end, No Man’s Sky is something of a tragedy. The Traveler believes that they are going to uncover the secrets regarding their origin by venturing to the galaxy’s center, but they’re instead sent back to the start of their journey. They believed that they would transcend beyond their universe and find a greater meaning, but they’re ultimately bound to that universe forever. It’s a game about the implications of being a character in a game and, if Elon Musk is to be believed, then we’re all currently experiencing a similar dilemma to the Traveler, too.